History of Present Illness: The patient noticed blurry distance vision and problems seeing at night for years, more noticeably in his left eye than in his right. When driving at night, he noticed a significant amount of glare from oncoming headlights. On a previous examination 15 years ago, he was informed he had cataracts. Past Ocular History: The patient wore glasses and had no other ocular history, including no history of amblyopia. Medical History: No chronic medical conditions, including no diabetes or history of steroid use. Family History: Father and brother had posterior polar cataracts. Social History: The patient smoked but did not drink alcohol. Review of Systems: A full review of systems was negative. Pupils: Reactive to light in each eye from 4mm in the dark to 2 mm in the light. No relative afferent pupillary defect (RAPD). Confrontation visual fields: Full, OD and OS. Normal lids and lashes, quiet conjunctiva, clear corneas. The anterior chambers were deep and quiet. The irides were normal and dilated well. 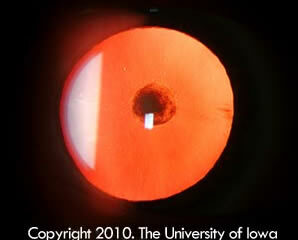 There was a central 2.5 mm opacity in the posterior aspect of the lens OD (See Figure 1). The lens OS had a central 3.0 mm opacity in the posterior aspect of the lens with surrounding posterior subcapsular cataract and trace anterior subcapsular cataract (See Figure 2). Neither lens had any nuclear sclerosis. The patient’s symptoms and anterior segment findings were consistent with posterior polar cataracts. His vision could be improved with refraction to 20/20-2 OD and 20/30-2 OS. Options for management were discussed with the patient including trying a new pair of glasses to improve distance vision or pursuing cataract surgery, which would likely improve distance vision as well as improve symptoms of decreased night vision and glare. Because the cataract was significantly affecting his activities of daily living, the patient opted to pursue cataract surgery for the left eye. 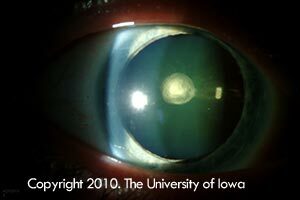 The patient was informed that cataract surgery for posterior polar cataracts is associated with increased risk of capsular rupture and vitreous loss that can lead to worse visual outcomes. Because of the increased complexity of the case, the surgical plan involved obtaining anesthesia with a retrobulbar block, avoiding hydrodissection, sculpting out a bowl in the anterior cortical and nuclear material prior to performing gentle viscodissection, avoiding rotation of the nucleus, and using the anterior vitrector to remove nuclear and cortical material with very low aspiration and slow cut rate settings. In this video you will note that after the cortical material was removed, the surgeon opted not to polish the remaining posterior subcapsular fibers to avoid rupturing the posterior capsule (See Video 1). This remaining material was treated with a Nd:YAG (neodymium yttrium aluminum garnet) laser capsulotomy post-operatively. 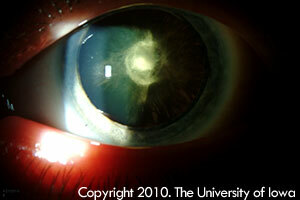 Posterior-Polar-Cataract from EyeRounds on Vimeo. Neither case resulted in posterior capsular rupture. 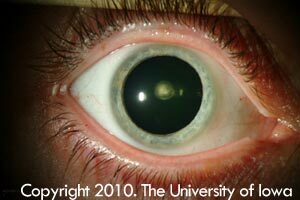 Pathophysiology: Posterior polar cataract is a congenital condition that can be sporadic or familial. Sporadic posterior polar cataracts are typically unilateral and associated with remnants of the tunica vasculosa lentis, an embryologic hyaloid structure that fails to regress. 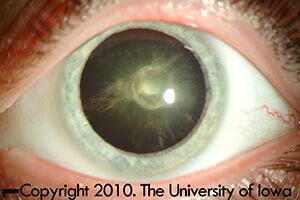 Familial posterior polar cataracts are typically bilateral and follow an autosomal dominant pattern of inheritance (Basic and Clinical Science Course, Section 11). More recently, mutations resulting in a 17-base-pair duplication in the PITX 3 gene have been associated with posterior polar cataract. This gene codes for a transcription factor that participates in anterior segment and lens development (Berry et al. 2004, Addison et al. 2004). The exact mechanism of how the mutation causes cataract is unknown, but the result is dysplastic, abnormal lens fibers that, as they migrate posteriorly from the equator, form an opacity in the region of the central posterior capsule. The opacity is usually a round discoid plaque, clearly demarcated from the rest of the lens and often associated with vacuoles in the lens surrounding the plaque (Eshaghian and Streeten 1980). Satellite opacities, which may represent fluid entering the lens, can also develop with time around the original plaque. The abnormal lens fibers can become adherent to the central posterior capsule, and the capsule around the plaque is often weakened. Thus, posterior capsular rupture is a feared complication when removing this type of cataract (Osher et al.1990). These cataracts often present in the first few months of life, and if visually significant at an early age, can lead to amblyopia. Most posterior polar cataracts are stationary but can progress in severity over time. Treatment: When posterior polar cataracts become visually significant (either in infancy if the cataracts are large enough to be amblyogenic, or in adulthood when they cause glare), they can be surgically removed. However, the high risk of posterior capsular rupture makes surgical removal often very difficult. There have been reported rates of posterior capsular rupture in 26-36% of cases depending on the series studied (Osher et al. 1990, Vasavada and Singh 1999). More recent studies demonstrate lower rates of posterior capsular rupture (Hayashi 2003). To avoid posterior capsular rupture the following techniques have been described in the literature. Injection of Viscoelastic: Avoid injecting excessive viscoelastic into the anterior chamber as the increased anterior pressure can cause posterior capsular rupture (Fine 2003). 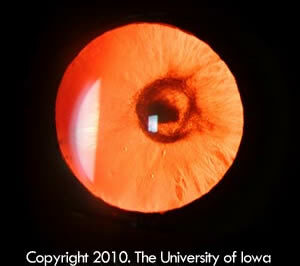 Capsulorhexis: Avoid a large anterior capsulotomy. In the setting of a posterior capsular rupture, a large opening may not provide enough support for a sulcus intraocular lens (Vasavada and Singh 1999). Hydrodissection: Avoid hydrodissection as the fluid wave can cause rupture of the weak posterior capsule (Vasavada and Singh 1999, Hayashi 2003). Viscodissection can be safely utilized if the nucleus has been debulked as was demonstrated in the above video. Hydrodelineation: "Inside-out delineation" is a technique described by Vasavada and Raj. A central bowl or trench is made in the anterior epinuclear material using low phacoemulsification settings [slow motion phacoemulsification utilizes low aspiration flow rate, vacuum, and infusion pressure (Osher 1993)]. The low vacuum level and aspiration flow rate provide a more stable anterior chamber and reduce the risk of surge, which can cause chamber collapse, anterior posterior movement of the iris lens diaphragm, and strain on the zonules and capsule. Low bottle height prevents the posterior capsule from ballooning (Vasavada and Singh 1999). After this initial sculpting, the nuclear material is hydrodelineated from the epinuclear material by carefully placing the tip of the syringe in the central lens material and slowly injecting fluid in this plane until a golden ring is seen. This "inside-out" hydrodelineation technique can avoid the inadvertant injection of fluid in the subcapsular plane, which can lead to posterior capsular rupture (Vasavada and Raj 2004). Lim and Goh describe another technique called "modified epinucleus pre-chop" for posterior polar cataracts with a dense nucleus. This technique involves pre-chopping the anterior epinucleus using "in situ" chop where the chopper is placed in the mid-periphery of the anterior epinuclear material and repositioned in different meridians with each chop. Once this anterior epinuclear material is removed, hydrodelineation and mobilization of the remaining dense nuclear core can be performed more easily (Lim and Goh 2008). Lens Rotation: This step should be avoided (Vasavada and Singh 1999). Nucleofractis: Aspirate the nuclear material if the nucleus is soft, or use slow motion phacoemulsification (example: bottle height 50 cm, vacuum 100 mm Hg, and aspiration flow rate at 20 ml per minute) to gently remove nuclear fragments within the epinuclear shell, which was created by hydrodelineation. Vasavada describes a stop, chop, chop and stuff technique where the vertical chopper is placed more centrally than in traditional chop and small continuous chopping produces small fragments which are then "stuffed" into the phaco tip by the chopper (Vasavada and Desai 1996). The V groove (also known as the "victory") technique described by Kelman in 1994 and "lambda" technique described by Lee and Lee in 2003 involve sculpting the nucleus in the shape of a V or the Greek letter lambda (λ). This is followed by cracking along both "arms" and then removing the central piece first. See Video 3. This offers an advantage of not stretching the capsule while removing the pieces (Kelman 1994, Lee and Lee 2003). Epinucleus removal: Vasavada and Singh utilize the phacoemulsification probe and low settings to gently strip the epinucleus 360 degrees. The central epinuclear material and plaque are aspirated last (Vasavada and Singh 1999). Fine describes using viscodissection for mobilizing the epinuclear and cortical material (Fine et al. 2003). The vitrectomy cutter can also be used to remove the remaining epinucleus. This may provide better control of the anterior chamber, avoids surge, and allows the surgeon to be prepared if the anterior hyaloid face is violated in the setting of posterior capsular rupture. Polish: Avoid polishing techniques as the posterior polar plaque is very adherent to the capsule, and polishing may lead to rupture of the capsule (Vasavada and Sing, 1999). Lens insertion: Vasavada and Raj recommend using an AcrySof IOL in the bag if possible, even if there is a small posterior capsular rupture. In the setting of posterior capsular rupture, the anterior vitreous face can be tamponaded with a dispersive viscoelastic, and then the lens can be gently inserted into the bag. The AcrySof lens unfolds gently, which will reduce the chance of extending a capsular tear. Their technique for manipulating the lens into the bag involves using a Lester manipulator to place the trailing haptic, rather than dialing the lens into place. Irrigation and aspiration to remove the viscoelastic should not be performed posterior to the IOL (Vasavada and Raj 2008). In summary, there are various surgical techniques that can be utilized to minimize the risk of posterior capsular tear in posterior polar cataract extraction. Avoid hydrodissection, perform hydrodelineation, use slow motion phacoemulsification settings, consider viscodissection of the epinuclear material, and do not polish the remaining posterior polar remnant. Laser posterior capsulotomy can safely be performed post-operatively. Chapter 4. Embryology: Rosenfeld,SI et al. Section 11. Lens and Cataract. 2007-2008 Basic and Clinical Science Course. San Francisco: American Academy of Ophthalmology; 2007; p. 34-35.